I love having my own blog. It gives me a creative outlet, the ability to inspire others, and it presents some great opportunities. The most exciting opportunity I have had so far is being able to review a new and adorable book by an up and coming author. 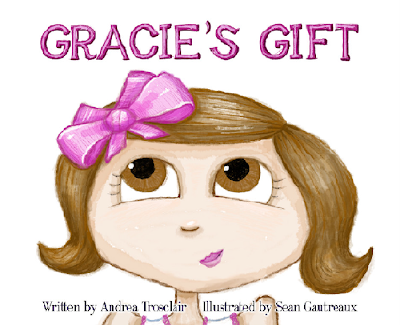 The book is called Gracie's Gift and it is the heart warming story about a little girl named Gracie who isn't very happy about having to wear bows all the time. One of her mommy's "Golden Rules" is "No bow? No go." On the day of her birthday party Gracie awakens to find a bow placed beside her beautiful party dress. She is upset that she has to wear a bow until her mommy points out that all of her gifts are topped with bows. Gracie's mommy explains that, "A beautiful bow on your sweet head it sits. That's how I celebrate my amazing gift." With the understanding of her mother's love Gracie wears her bows proudly in the end. For anyone with daughters this book is an absolute treasure and a beautiful reminder of the bond a mother and daughter share. I read this book with my own little bow-adorned gift and she loved it. We have read it almost every night before bed. This book is so heartwarming, but what makes it even more amazing is the story of the author. Andrea Trosclair is a mother of two little girls living in Baton Rouge, LA. She worked as a registered nurse until 2005 when she was diagnosed with Multiple Sclerosis. I am so inspired by this woman. Instead of dwelling on the negative she celebrates and gives thanks for her children who are her own little gifts. We could all take a page from Andrea's book. I would like to say a big Thank You to Andrea Trosclair for giving me the privilege of adding this beautiful story to our family library. "Like" Trosclair Tales on Facebook for information on future events, upcoming books, and giveaways. You can also click HERE to go directly to the author's website. I would love to purchase copies of this book but I am unable to find it anywhere? Do you know why it’s not being sold anymore?? ?